However, no matter how hard you try, there might be instances when you’ll be involved in an accident because of someone else’s negligence. And in times like these, you need to know what to do legally. You’re dealing with properties and sometimes, your life in this kind of situation, so it’s just right that you’re knowledgeable enough about what to do legally. You might argue that you’re not involved in an accident right now and you don’t know anyone who is so there’s no point in knowing all of these things. That might be true but once you’re in that situation, do you have the time to educate yourself? To read reliable sources? No, you might be too stressed to even think about that. 1 – You should stop and stay at the scene: There are instances when accidents are clearly one party’s fault and the other party was purely a victim. But regardless of who’s at fault with the accident, you should never run away. You should halt, and pull over your vehicle safely. ● If you’re at fault as to why the accident happened and you never bothered to stop at the scene of the accident, you could be fined, sent to prison or both – and you don’t want that to happen. ● If you think you’re the victim of the accident, you should also stop at the scene because the other party (who’s probably at fault) might tell a one-sided story to the police officers. ● Once you’ve stopped, assess any injuries in your body. You can also check with the other party to see if they’ve sustained any injuries, and help if you can. If there are injuries which need immediate assistance, call for help. 2 – You should report the accident: Accidents vary in different ways. There are accidents which cause damage to the vehicles involved and even injuries to the drivers and passengers. Because of this it should be reported. ● Whenever properties and lives are affected in an accident, you should wait for a police officer to respond to the scene and report what happened. You should never leave the scene unless the police officer tells you to do so. ● But if the accident didn’t cause even a single scratch on your property and to the other party as well, you can leave the scene even without the police officer’s permission. ● Keep in mind that you’re not required to give a verbal statement to the police as anything you say in this situation can be used against you. If you’re involved between a car and truck accident, it’s always best to ask an attorney for their professional help before talking to the authorities. 3 – You should get the details of everyone involved: Yes, you might be in total shock when an accident happens but you should never forget to get the details of everyone involved in the accident. This is vital information which can help you if there are court hearings in the future. ● You need to get the name, contact details, vehicle registration numbers of the other parties involved in the accident. You should also get the information of the people who were able to witness the accident. Their statements can have a big impact on the proceedings if a case is filed. ● If you’re too injured to do all of these things, you can ask the help of the police officer on your behalf. 4 – You should get a copy of the police report: Everything going on in the scene of the accident – police officers, witnesses, damages – can become very overwhelming. But no matter what happens in the accident, you should take the time to get a copy of the police report so you’ll know the liability of the accident. This will allow you to determine who pays who and this document will be helpful once you file for insurance claims. The idea of being involved in an accident is already very taxing to think about, and that feeling will intensify if you don’t have any idea on what to do. 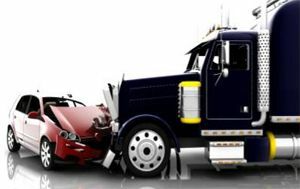 The things to do legally when involved between a car and truck accident should be something that you have saved in your memory. The information presented in this article can be a very big help for you. You’ll now have an idea on what to do legally, without compromising the other party’s legal rights and also your own.